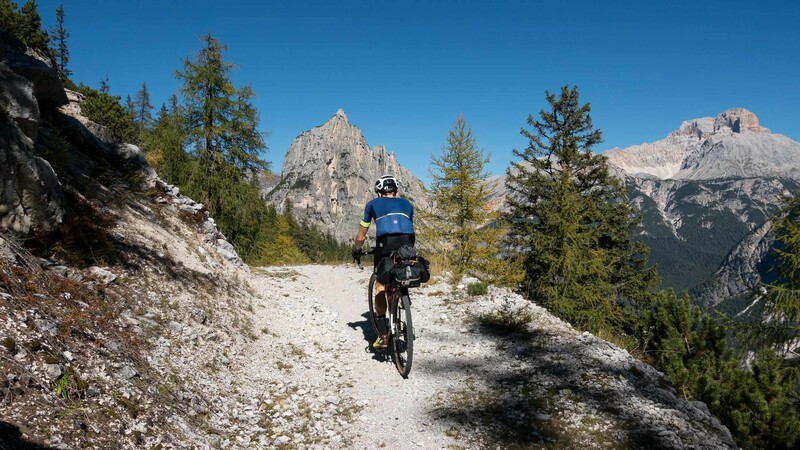 Discover the Dolomites with the gravel bike. 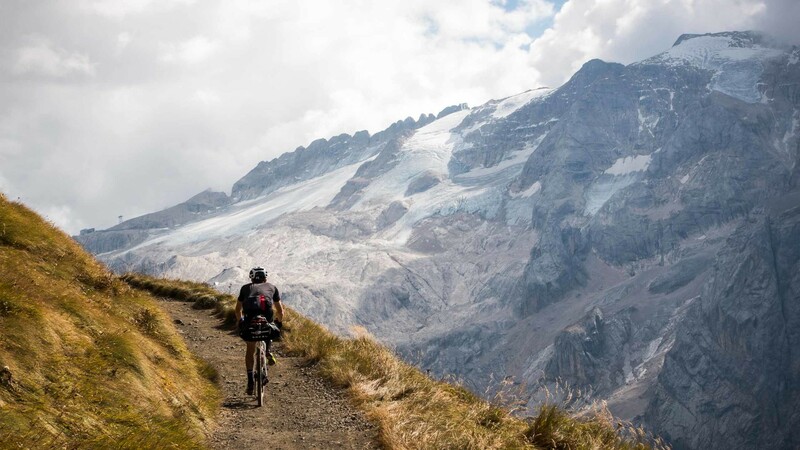 Hit the dirt on off-road routes with your Gravel bike. First there was cyclocross and then came the era of the Mountain Bike! Mountain Bikes evolved, developing a 29” wheel and wide handlebars. Some yearned for the days of yore and came up with the great idea to build a hybrid between the two…and that’s when the GRAVEL bike made its entry on the scene! 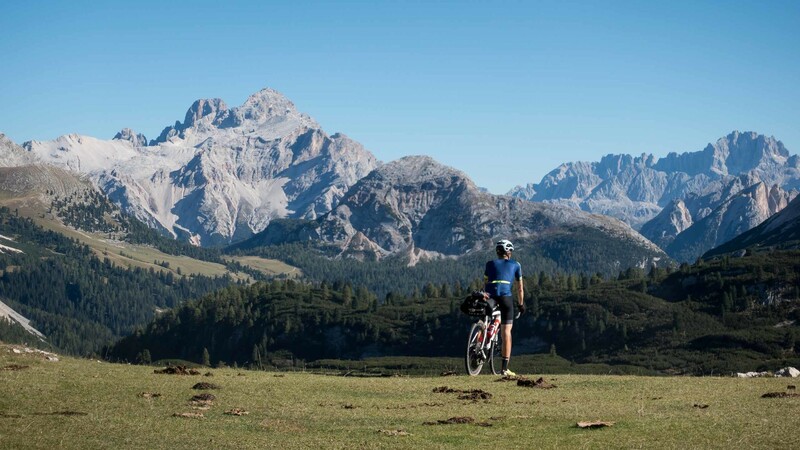 We’ve chosen the most spectacular off-road tracks (and some single tracks) so that you can ride the Dolomites in a “figure 8”. Arrival in Alta Badia: meet and greet in Badia and briefing by one of our guides. Dinner and overnight stay in hotel. From Badia to Passo Valparola. Riding at the bottom of the Tofana to Ra Stua and ascent to Sennes. Dinner and overnight stay in hut. 2nd day: approx. 29 km (18 miles) / 1.200 m (3937 feet) e.g. / 1.200 m (3937 feet) e.l.
From Sennes passing through the Fanes Natural Park to the plateau of Pralongia. Dinner and overnight stay in hut. 3rd day: approx. 31 km (19,3 miles) / 1.490 m (4888 feet) e.g. / 1.330 m (4364 feet) e.l.
From Pralongià to the panoramic path "Viel del Pan". Through the "Glühwein trail" to Col Rodella. Dinner and overnight stay in hut. 4th day: approx. 66 km (41 miles) / +2.653 m (8705 feet) e.g. / -3.611 m (11847 feet) e.l.
From Col Rodella through Alpe di Siusi to Seceda. Descent to Zans alp and back to Badia, passing through the mountain village of Longiaru. Dinner and overnight stay in hotel. Are the stages too long? Want an alternative? Contact us and we can organize a personalized program that fits your needs. All the services mentioned under the heading "price included"
Beverages and anything not mentioned under the heading "Included in the price"
How experienced do I need to be to participate? This program requires excellent skills with a gravel bike. In other words, if up to now you’ve only had experience with a road bike and you’re just starting out on gravel, then this program is not for you. But, write to us – we are sure to have an alternative just for you. If you’ve already learned the ropes on a mountain bike, then you already have the basic technical skills to take on this challenge. What kind of characteristics should my gravel bike have? Here at Holimites we’ve tried these trails with various setups. We can definitely recommend using tires with a minimum width of 40mm. The ideal range to tackle the steepest climbs is 34c front/42c rear. What’s really important is that your gravel bike should be in excellent condition and should be checked by a specialized mechanic, having replaced worn parts (for example disc brake pads). We also recommend bringing along space parts such as brake pads or other parts that are from lesser-known brands that may be difficult to find in our specialized shops. weight which depends on the number of participants in your group. The programs on the catalog don‘t match my expectations. Are there alternative offers? On request, Holimites can customize a program for you. Is the tour too long or the stages to challenging? Do you prefer a different itinerary? Would you like to book some extra days to relax in the hotel or on a mountain hut? Just send us a request and we will do our best to meet your needs. You will be surprised of how lovely our mountain huts are. 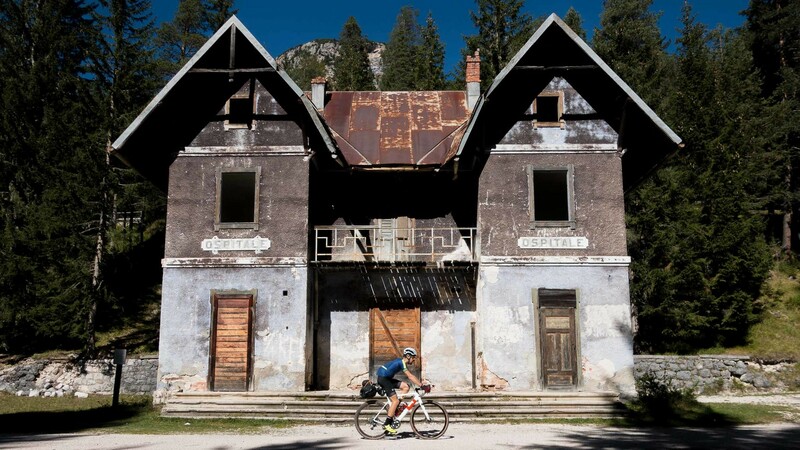 However, they have to be considered a rifugio in the mountains and not a hotel. So you won’t find all the luxury features you find in the towns. In the huts there are blankets and pillows. We suggest to bring sleeping bags inlay with you. All hotels and huts are well informed about dietary restrictions, like gluten or lactose intolerance. Everywhere you will find a vegetarian or vegan alternative. Not all huts accept credit cards. So we suggest to bring some cash with you, to pay drinks, snacks or extras which are not included in the offer. What about having lunch in the mountains? For lunch you can stop in one of the huts to taste some traditional food or you have the possibility to buy a lunch package in the hut where you overnight. How to get more information about this offer? Just contact us and we will be happy to help you further. But as we like also other people to speak, check out the resume written by Tim Wiggins for the XPDTN3 club when we tested for the first time this amazing gravel adventure. 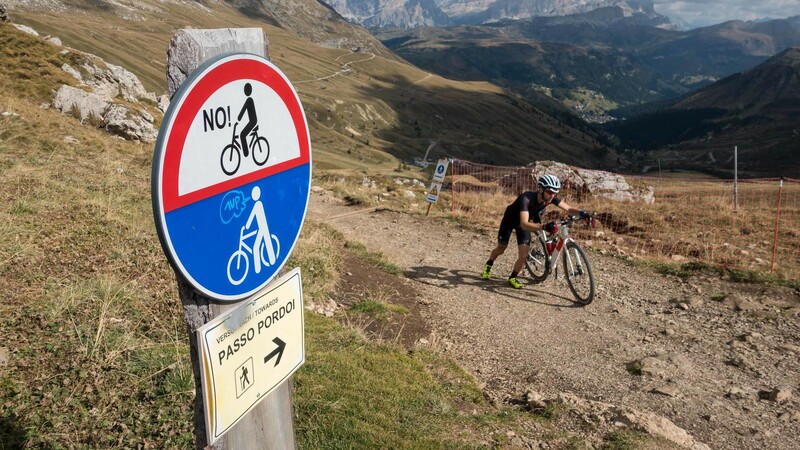 DOLOMITES Steep climbs. Huge walls. Big fun.